【干货】SHOOTER俱乐部大川哥哥的IDPA例书吐血校对版本。 - 相关资讯 - 作战2000论坛 - Powered by Discuz! Founded in 1996, the International Defensive Pistol Association (IDPA) is the governing body for IDPA competition, a handgun-centric shooting sport based on simulated self-defense scenarios. The IDPA competition format was designed to be enjoyable for all shooters of all skill levels, with a premium put on the social interaction and camaraderie of the members. Participation in IDPA matches requires the use of handguns, holsters and other equipment suitable for concealed carry self-defense. With that in mind, and keeping the shooters' best interests in mind, IDPA's founders established equipment requirements that are based on commonly available firearms and gear, allowing individuals the opportunity to compete with minimal investment. Today, thanks to the vision of its founders and a commitment to serving the organization's loyal membership, IDPA stands as the fastest growing shooting sport in the United States with over 25,000 members from all 50 states, and over 400 affiliated clubs hosting weekly and monthly competitions, and membership representing over 70 nations. Our main goal is to test the skill and ability of the individual. Equipment that is designed with no application for daily, concealed carry is not permitted in this sport. 这一段，大川哥忘记翻译了么? The Fundamental Principles are a guide to all members. A.Promote safe and proficient use of firearms and equipment suitable for concealed carry self-defense. B.Offer a practical shooting sport encouraging competitors to develop skills and fellowship with like-minded shooters. C.Provide a level playing field for all competitors that solely tests the skill and ability of each individual, not their equipment. D.Provide separate divisions for equipment and classifications for shooters, such that firearms with similar characteristics are grouped together and people with similar skill levels compete against each other. E.Provide shooters with practical and realistic courses of fire, and test skills that could be required to survive life-threatening encounters. F.Strongly encourage all IDPA members to support our sponsors when making purchases of equipment and accessories. Industry sponsors have been instrumental in IDPA’s success at all levels including Club, State, Regional, National, and International levels. G.Develop and maintain an infrastructure that will allow IDPA to be responsive to our shooters. While IDPA can never be all things to all people, respectful constructive suggestions from our members, which follow IDPA Fundamental Principles, will always be welcome. A.Concealable: All equipment (except flashlights) will be placed so that it is not visible while wearing a concealment garment, with your arms extended to your sides, parallel to the ground. B.Practical: All equipment must be practical for all day concealed carry self-defense, and worn in a manner that is appropriate for all day continuous wear. A.Competitors will not attempt to circumvent or compromise any stage by the use of inappropriate devices, equipment, or techniques. B.Competitors will refrain from unsportsmanlike conduct, unfair actions, and the use of illegal equipment. C.The IDPA Rulebook is not intended to be an exhaustive description of all allowed and disallowed equipment and techniques. Shooter equipment and techniques should comply with the basic principles of IDPA and be valid in the context of a sport that is based on self-defense scenarios. A reasonable application of common sense and the IDPA Founding Concepts will be employed in determining whether a device, technique, or piece of equipment is permitted under the IDPA rules. D.At its core, IDPA is a self-defense scenario based sport. The props used to create the Course of Fire (CoF) are often incomplete but represent buildings, walls, windows, doorways, etc. The CoF will indicate available shooting positions. The props will be defined in the CoF walk through. E.Individual rehearsals of a CoF, including air gunning and taking sight pictures, are not permitted within the CoF boundaries. F.Shooting from behind cover is a basic premise of IDPA. Competitors will use all available cover in a CoF. G.IDPA is a shooting sport based on concealed carry. All courses of fire will be shot using a concealment garment unless stipulated otherwise. H.In any single contest, a shooter must use the same firearm on all stages unless the firearm becomes unserviceable. I.Re-shoots are allowed for stage equipment failures or SO interference. J.English is the official language of IDPA. Range commands used in all matches regardless of location or nationality of participants, will be in English. The English rulebook prevails. A.One issue critical to the long-term success of this shooting discipline is that problems shooters are asked to solve must reflect self-defense principles. The IDPA founders agreed upon this when they set out to structure IDPA guidelines and principles. IDPA should help promote basic sound gun handling skills and test skills a person would need in a concealed-carry encounter. Requirements such as the use of cover while engaging a target, reloading behind cover, and limiting the number of rounds per string were all based upon that principle. “String of Fire” refers to a section of the course of fire that is initiated by a start signal, and ends with the last shot fired. There may be more than one string in a stage. “Cover” refers to a position where a shooter can engage targets with a portion of their upper and lower body behind an object such as a wall. B.A CoF should test a competitor’s shooting skills. Allowances will be made for physically challenged or disabled shooters. Match Directors should always attempt to make the CoF accessible for all shooters. C.While we recognize that there are many schools of thought in training for self-defense concealed carry, the primary focus of IDPA is in the continuing development of safe and sound gun handling skills that are universally accepted. D.IDPA rules will be equally enforced for all classifications of IDPA members. Colonel Jeff Cooper’s Four Basic Rules of Firearm Safety have appeared in the beginning pages of books, videos, and training courses for more than 30 years. They are time honored and although they are not IDPA safety rules, they serve as the foundation of the safety rules below. All guns are always loaded. Never let the muzzle cover anything you are not willing to destroy. Keep your finger off the trigger till your sights are on the target. Identify your target, and what is behind it. The Safety Rules below serve as the cornerstone for every IDPA shooter to follow, including Safety Officers (SOs), Match Directors (MDs), and Area Coordinators (ACs), so that our events are safe and enjoyable to a wide range of participants. They are to be adopted for all IDPA events. Unsafe firearm handling will result in immediate Disqualification (DQ) from an IDPA match. The following is a non-exclusive list of unsafe behaviors. A.Endangering any person, including yourself. This includes sweeping one’s self or anyone else with a loaded or unloaded firearm. Sweeping is defined as allowing the muzzle of the firearm (loaded or unloaded) to cross or cover any portion of a person. Exception: Some body types combined with some holster types makes it almost impossible to holster a firearm or remove the firearm from the holster without sweeping a portion of the shooter’s lower extremities. Thus, a match Disqualification is not applicable for sweeping of the shooter’s own body below the belt while removing the firearm from the holster or holstering of the firearm, provided that the shooter’s trigger finger is clearly outside of the trigger guard. However, once the muzzle of the firearm is clear of the holster on the draw, sweeping any part of the body is a Disqualification. Example: Sweeping one’s leg on a seated start is a DQ. B.Pointing the muzzle beyond designated “Muzzle Safe Points” if used, or beyond the 180-degree Muzzle Safe Plane if used. C.Intentionally engaging (discharging the firearm) anything other than a target or an activator. b.striking up range of the shooter. 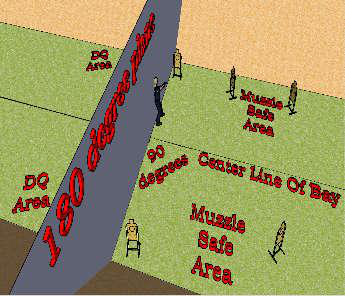 c.into the ground downrange closer to the shooter than 2 yards, unless engaging a low target that is within 2 yards. e.during Load And Make Ready, Unload and Show Clear, Reload, or Malfunction Clearance. g.while transferring a firearm from one hand to the other. h.while handling a firearm except at the firing line. a.With verbal instruction from a SO. b.While engaging targets in a CoF under the direct supervision and visual contact of a SO. c.When in a designated “Safe Area”. F.Pointing the muzzle over the berm during the “Pull the Trigger” portion of Unload and Show Clear. G.Drawing a firearm while facing up range. 2.3.1 Dropping a loaded or unloaded firearm or causing it to fall, during Load And Make Ready, the shooting of a string or stage, reloads or malfunction clearance or during Unload and Show Clear will result in disqualification from the match. If a shooter drops a firearm, the SO will immediately give the command “Stop”. The SO will pick up/recover the dropped firearm and render it safe and unloaded before returning it to the shooter. The shooter will be disqualified from the IDPA match. 2.3.2 If a shooter drops a loaded or unloaded firearm or causes it to fall within a stage boundary, the shooter is disqualified from the match. 2.3.3 Dropping an unloaded firearm or causing it to fall while outside of stage boundaries is not within IDPA’s control, and is subject to local Range policy. 2.4.1 Ear protection and impact resistant eye protection are required to be used by everyone attending an IDPA shooting event. The responsibility for safe and serviceable ear and eye protection falls completely on the shooter or spectator. IDPA recommends that hearing protection have a minimum 21dB NRR rating and that eye protection have a minimum ANSI Z87.1 impact rating and side shields. will be given to the shooter. If the shooter’s eye or hearing protection becomes dislodged during a CoF, the same action applies. If the shooter discovers missing or dislodged eye or hearing protection before the SO and stops, the shooter will also be given a reshoot. 2.4.3 A shooter who intentionally loses or dislodges eye and/or ear protection during a CoF will be disqualified. Pistols used in competition will be serviceable and safe. The responsibility for safe and serviceable equipment falls completely on the shooter. The MD will require a shooter to withdraw any pistol or ammunition observed to be unsafe. In the event that a pistol cannot be loaded or unloaded due to a broken or failed mechanism, the shooter must notify the SO, who will take such action as he/she thinks safest. Fingers must be obviously and visibly outside the trigger guard during loading, unloading, drawing, holstering, while moving (unless engaging targets) and during malfunction clearance. A.First offense is a Procedural Error penalty. B.Second Offense is a DQ from the match. C.Each “Finger” violation will be clearly noted on the shooter’s score sheet for tracking purposes. All CoFs will be started with the pistol holstered, safeties engaged as required by different divisions, and hands clear of equipment including the concealment garment unless other positions for the pistol are stipulated in the written stage description (table top, drawer, pack, purse, in the firing hand, etc.). 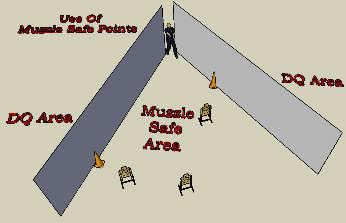 There are three types of muzzle safe area indicators used in IDPA. The written stage description will describe which type of muzzle safe point is used or if the two types are used in concert. One or both may be used on a single stage, however if no muzzle safe cones or flags are present on a stage, the default is the 180° rule. A.Muzzle Safe Points: A Muzzle Safe Point is a physical and clearly visible marker such as a traffic cone or stake in the ground with a brightly colored flag or marker tape attached. B.180-Degree Plane: The 180° plane is an imaginary infinite vertical plane drawn through the centerline of the shooter’s body, perpendicular to the centerline of the shooting bay that moves with the shooter as the shooter moves through the stage. When facing downrange, the violation of the 180-degree plane when drawing from a muzzle rearward holster configuration or while holstering a firearm into a muzzle rearward holster configuration is not an infraction. If the muzzle of the shooter’s firearm points further up range than a “Muzzle Safe Point” the shooter will be disqualified from the match. The shooter will be given the command “Stop.” The shooter will stop immediately, place the trigger finger obviously and visibly outside the trigger guard of the firearm, and wait for further instructions from the SO. Muzzle Exclusion Zones must be marked on doors that the shooter is required to open during the CoF. This type of muzzle safe point designates a keep out area and should be a minimum dimension of 6” square. If the muzzle points at this keep out area while the shooter is touching the door knob/handle, the shooter will be disqualified. A.Each Safe Area must be clearly identified by visible signage, and include a table with the safe direction and boundaries clearly shown. B.Unloaded firearms may be handled at any time. This area is used for bagging or un-bagging a firearm, holstering, drawing, dry firing, or equipment adjustment. C.A Safe Area may also be used for inspections, stripping, cleaning, repairs, and maintenance of firearms, ammunition feeding devices, or related equipment. D.The muzzle of the firearm must be pointed in a safe direction. E.Handling of ammunition, loaded ammunition feeding devices, loose rounds, dummy ammunition, snap caps, simunitions, training rounds, or loaded firearms is not permitted in safe areas. F.A Safe Area may also be used, while accompanied by a SO, to render safe a firearm that has locked up and contains a live round or rounds. G.Reload practice within the Safe Area is not allowed. An empty magazine may be inserted into a firearm to test functionality or to drop the hammer on a firearm with a magazine disconnect, but reload practice is prohibited. The violation of any of the cases above will result in disqualification from the match. The question of Hot and Cold ranges at the local club level is subject to individual club policy. This issue is the sole responsibility of local clubs and is beyond IDPA’s control. Matches sanctioned by IDPA are required to operate under the Cold range rule, but may use Hot Bays if desired. A “Cold Range” is defined as a range where all firearms must be unloaded unless under the direct supervision of a SO. A “Cold Range with Hot Bays” is defined as a range that does not allow loaded firearms in the holster outside of the shooting bays but does allow for loaded firearms in the holster within the shooting bays as directed by and under the supervision of the SOs. Loaded firearms may only be handled while on the firing line when the shooter is given specific Range Commands and is under the direct supervision of a SO. With direct supervision from the SO, and when given specific Range Commands, an entire squad of shooters will line up across the bay, face down range and will “Load And Make Ready” as a group. The perimeter of the bay will be well defined as well as any area designated as a "Safe Area" where handling of ammunition and loaded firearms is not permitted. A procedure for requesting to be unloaded to exit the bay will be established by the CSO and explained to all participants during the stage briefing. If a shooter for any reason needs to leave a Hot Bay, the shooter must contact one of the SOs in that bay to safely unload the firearm before leaving the bay. If a shooter for any reason does not wish to load his firearm with the group, the shooter is not to be penalized. A Hot range is defined as a range where each shooter has the choice to carry a loaded firearm at any time. Loaded or unloaded firearms may only be handled while on the firing line and under the direct supervision of a SO. Many of the range commands given to a shooter by the SO are for safety, while the rest are for stage administration. To allow a shooter to compete anywhere in the world and hear the same commands, the IDPA range commands will only be given in English, the official language of IDPA. These exact range commands must be used and local variations are not allowed. This is the first command given to each shooter starting the action of shooting a stage. This command signifies the start of the CoF. The shooter will make sure that their eye and hearing protection is in place. It is also notification to anyone in the shooting bay to check that their own eye and hearing protection is properly fitted. After “Load and Make Ready,” the SO will ask the shooter “Are You Ready?” If ready, the shooter should respond verbally, or by obvious nodding of the head, but may also choose to stand ready. If there is no response from the shooter in approximately 3 seconds, the shooter is assumed to be ready. If the shooter is not ready when this question is asked the shooter must respond “Not Ready”. If the shooter continues to not be ready, the shooter must take a step out of the starting position. When ready, the shooter will assume the starting position and the “Are You Ready” question will be asked again. The shooter is expected to be ready to proceed approximately 15 seconds after the “Load And Make Ready” command. If the shooter is ill prepared and needs more than fifteen seconds to get ready, the shooter will be advised that he/she is being given approximately 15 seconds more to prepare. If the shooter is still not ready after that period, he/she will receive a Procedural Error penalty and will be moved down in the shooting order. This command is given after the shooter is ready. This command will be followed by the start signal within 1-4 seconds. The shooter may not move or change positions between the “Standby” command and the start signal, unless required to do so by the CoF. This command is given when the shooter’s finger is not obviously and visibly outside the trigger guard when it should be, as noted above. This command is given when the muzzle of the shooter’s firearm is pointed near a muzzle safe point. The shooter must correct the errant muzzle and continue with the stage. See muzzle safe points above. This command is given when something unsafe has happened or is about to happen during a stage, or when something in the stage is not correct. The shooter must immediately stop all movement, place the trigger finger obviously and visibly outside the trigger guard, and await further instruction. Failure to immediately stop and remove the trigger finger from within the trigger guard will result in Disqualification from the match. This command will be issued when the shooter has apparently finished shooting the stage. If the shooter is finished, all ammunition will be removed from the firearm and a clear chamber/cylinder will be shown to the SO. If the shooter is not finished, the shooter should finish the stage and the command will be repeated. Once the SO has inspected the chamber/cylinder and found it to be clear, this command will be issued and the shooter will comply. The shooter will point the firearm at a safe berm and pull the trigger to further verify that the chamber is clear. If the firearm fires, the shooter will be disqualified from the match. This requirement also applies to firearms with a de-cocker or magazine disconnect. For firearms with a magazine disconnect, an empty magazine, or dummy magazine must be inserted before the trigger is pulled, and then removed again. This command is not needed for revolvers. The shooter will safely holster the firearm. This command indicates to everyone within the stage boundaries that the range is clear. This command ends the CoF and begins the scoring and resetting of the stage.